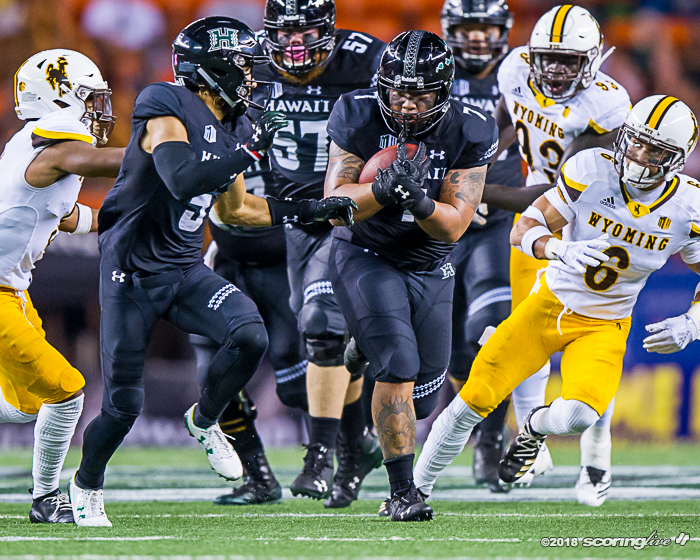 HALAWA — The last time Chevan Cordeiro threw a pass in a meaningful game of football at Aloha Stadium, it was a 53-yard touchdown bomb to win the 2017 Hawaii High School Athletic Association Division I-Open State Championship. 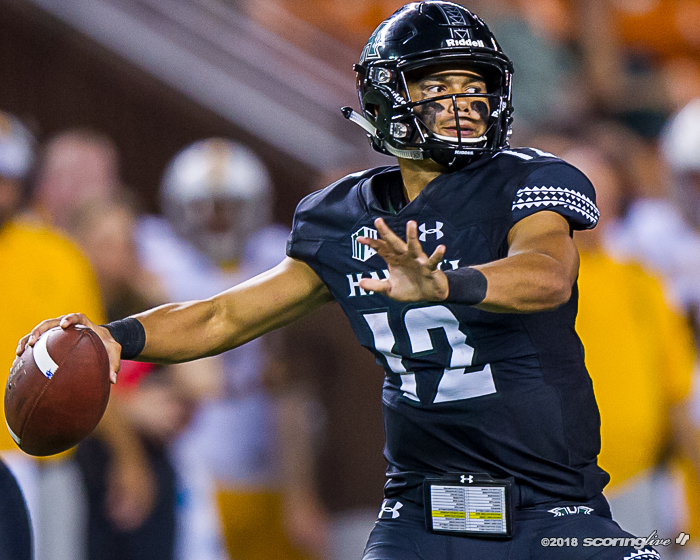 The recent Saint Louis '18 graduate got the start at quarterback in place of Cole McDonald and hit JoJo Ward on a 38-yard bomb for the game-winning score to lift the University of Hawaii Rainbow Warriors over Wyoming, 17-13, Saturday night in a Mountain West Conference contest at Hawaiian Financial FCU Field at Aloha Stadium. 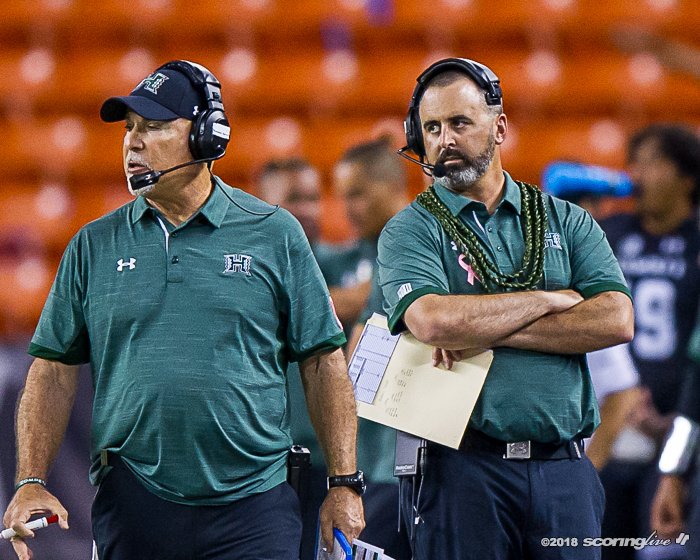 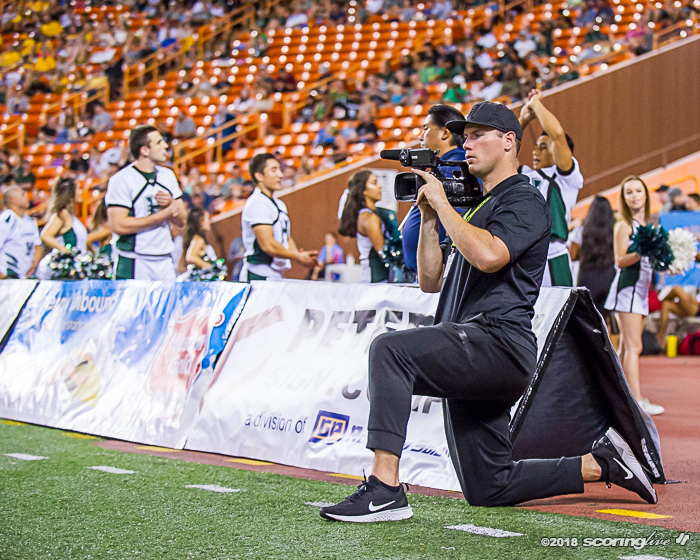 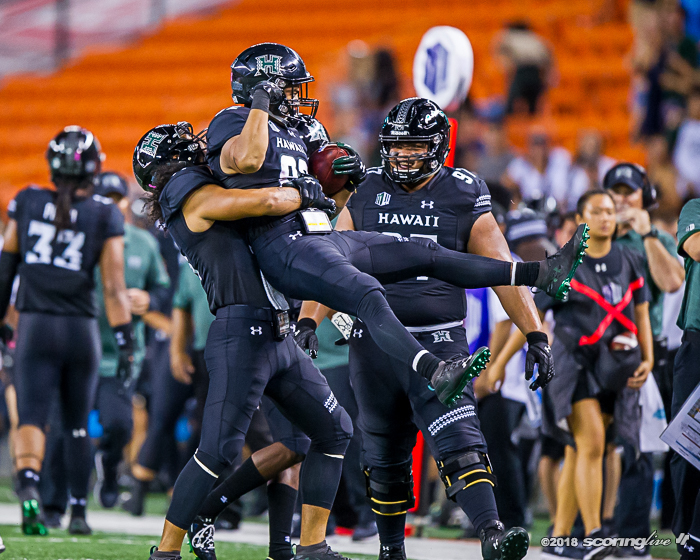 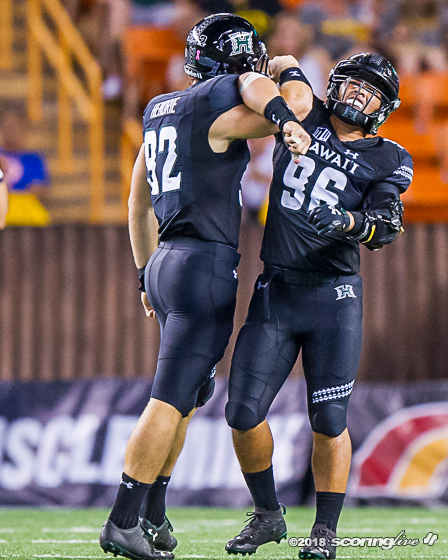 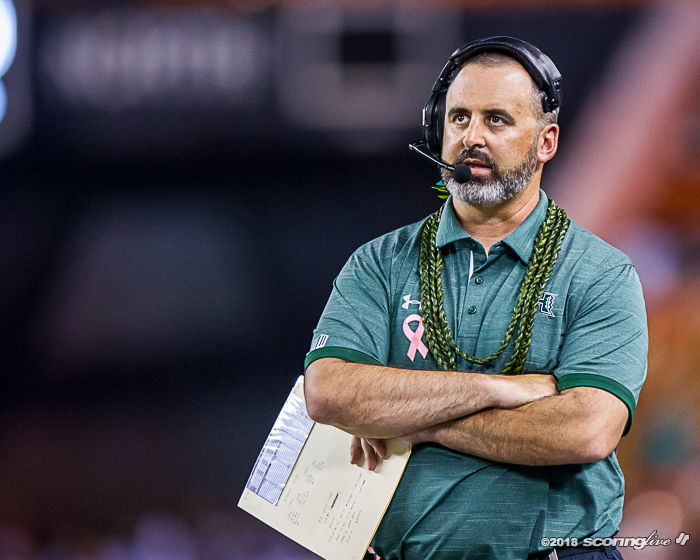 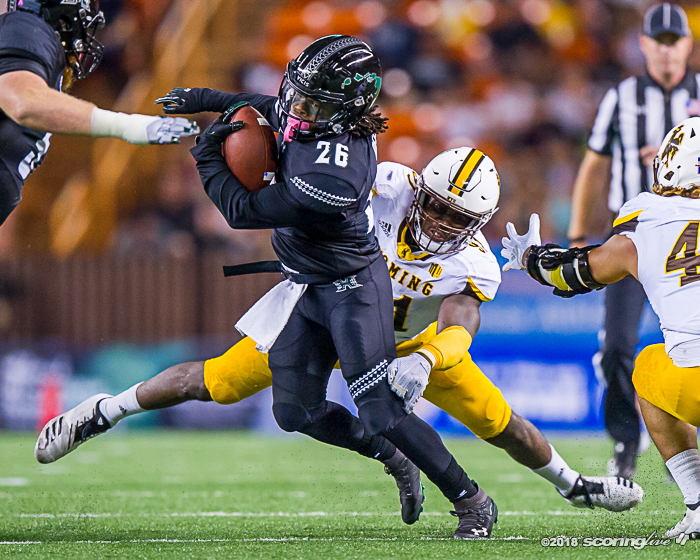 With Hawaii trailing 13-10 following Cooper Rothe's 23-yard field goal at the 5:31 mark of the final period, Cordeiro drove the Rainbow Warriors down the field with the help of a key one-yard fourth down conversion from running back Dayton Furuta (Mililani '14). 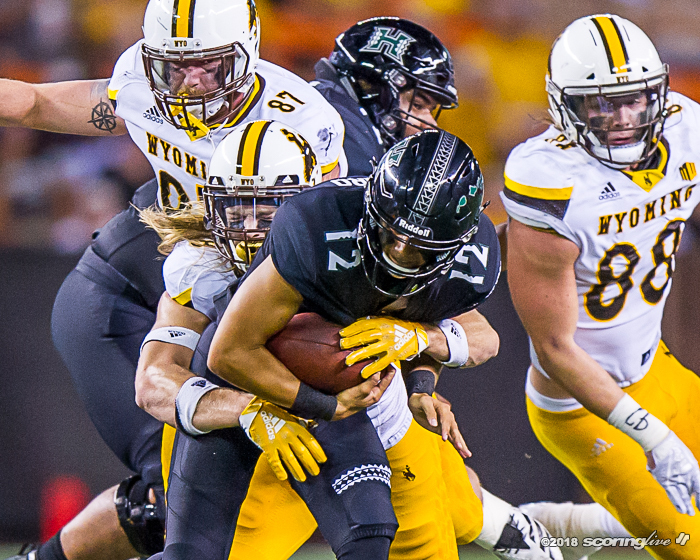 After taking a 3-yard sack at the Wyoming 38 yard line, Cordeiro rolled out of the pocket and shaked off a would-be tackler before heaving the ball for a leaping Ward on the right side of the end zone. 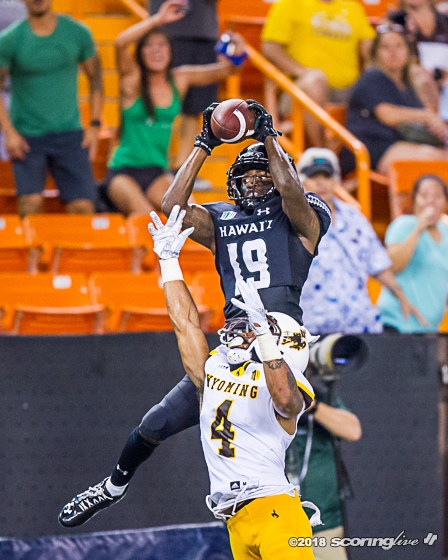 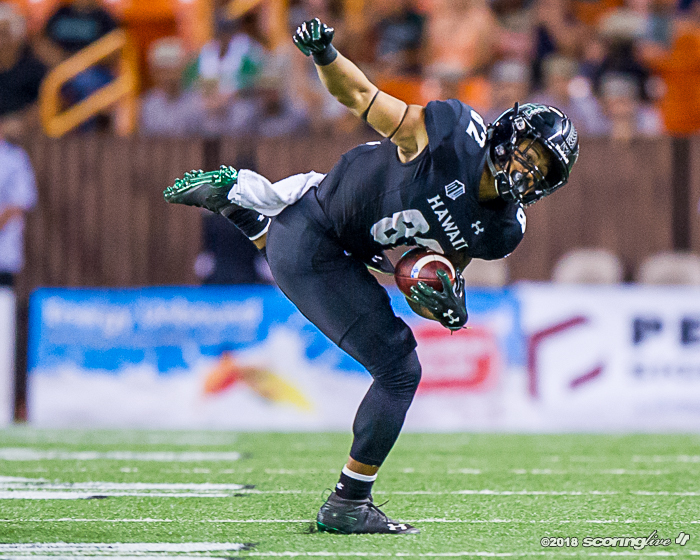 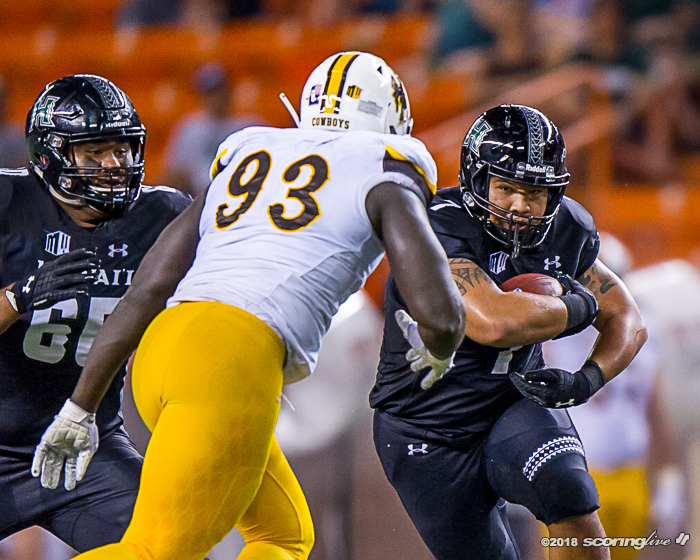 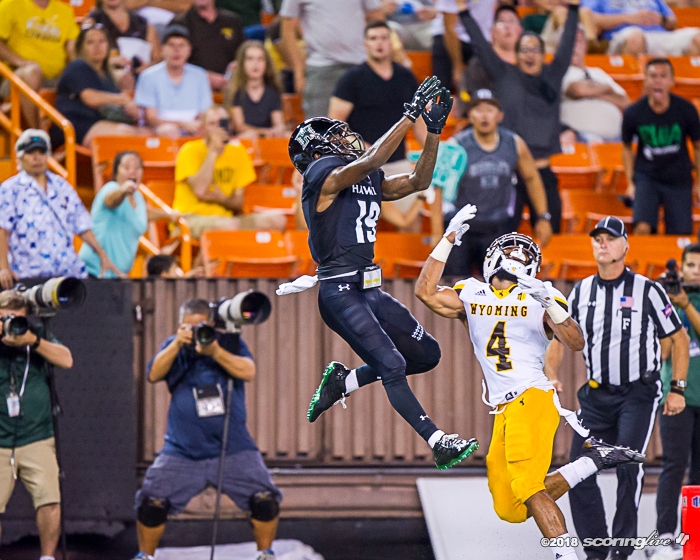 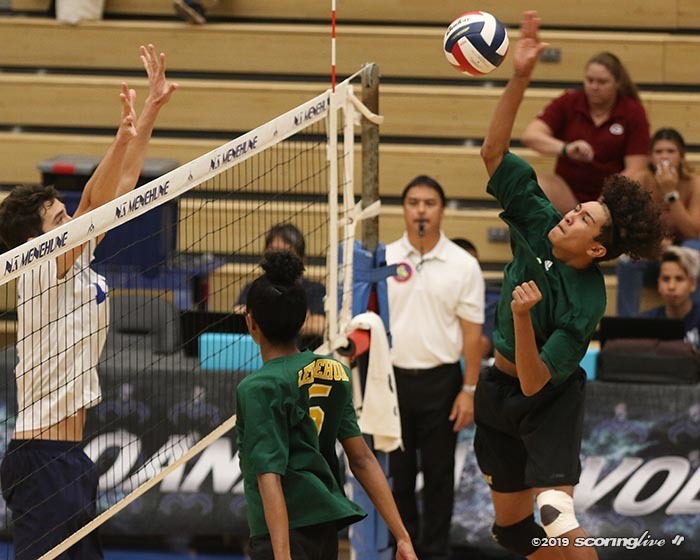 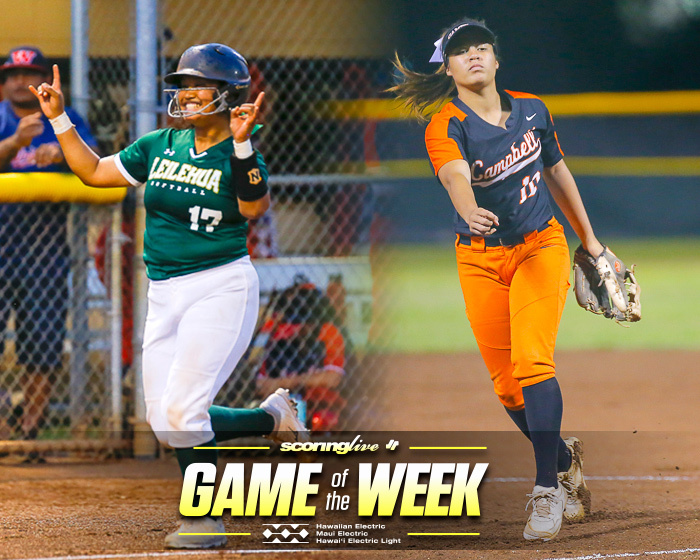 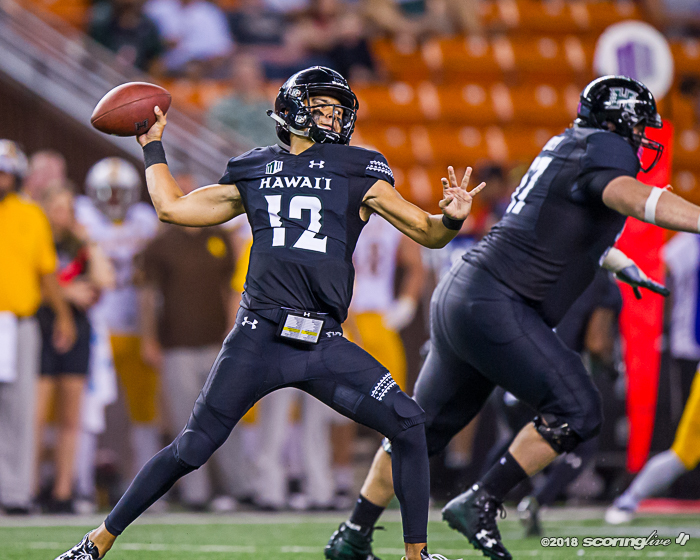 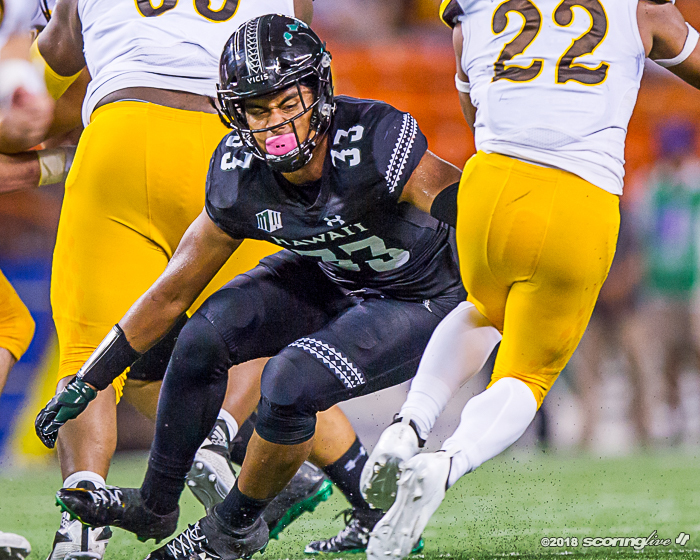 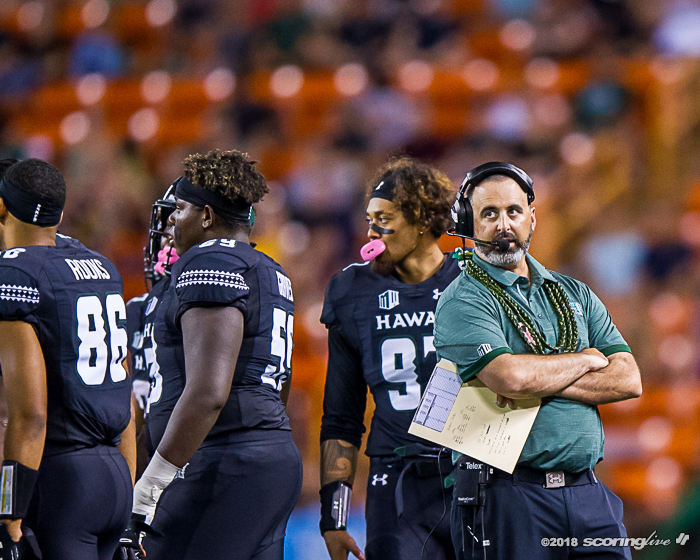 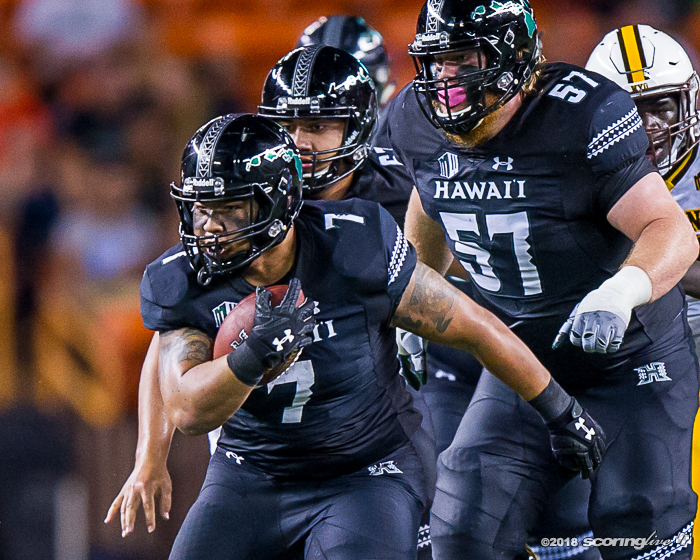 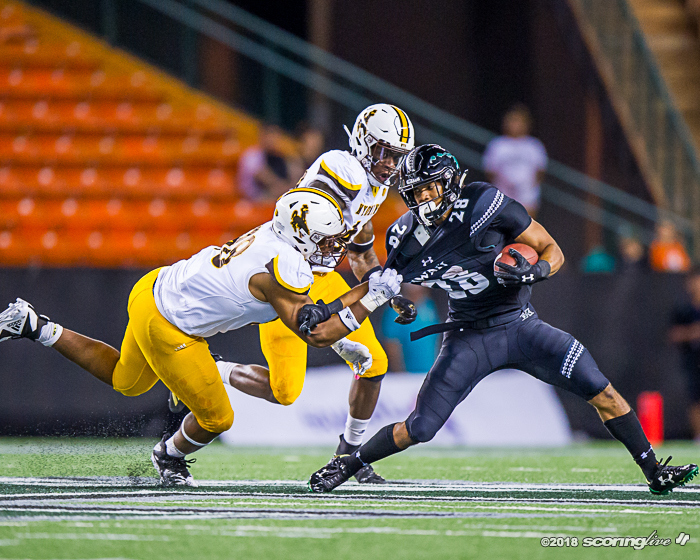 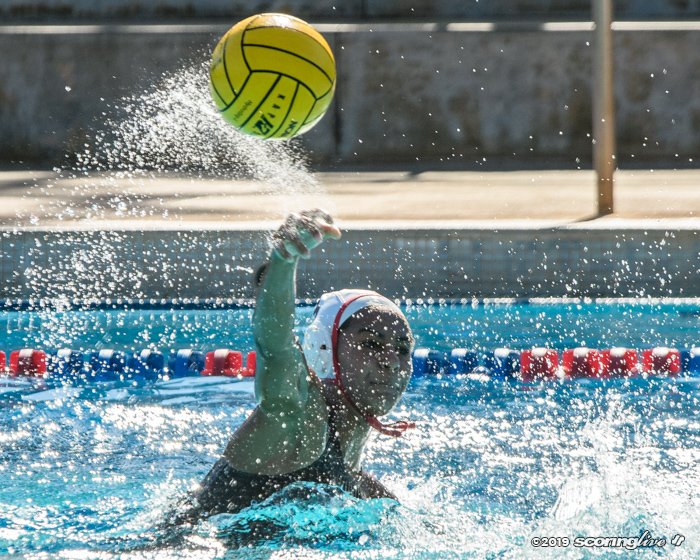 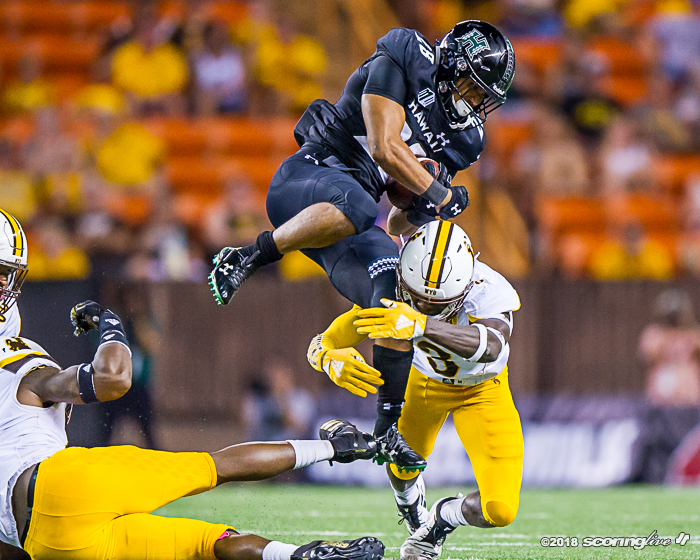 "Chevan is excellent, and so is Cole, at playing off-script," Hawaii coach Nick Rolovich said. 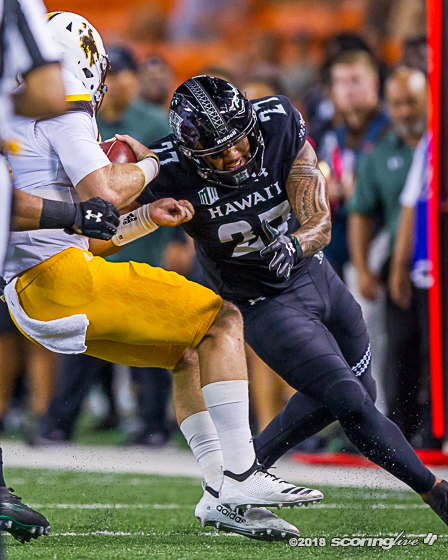 "When he was almost sacked on that, I think anyone in the stadium could smell the determination of him fighting through that tackle. 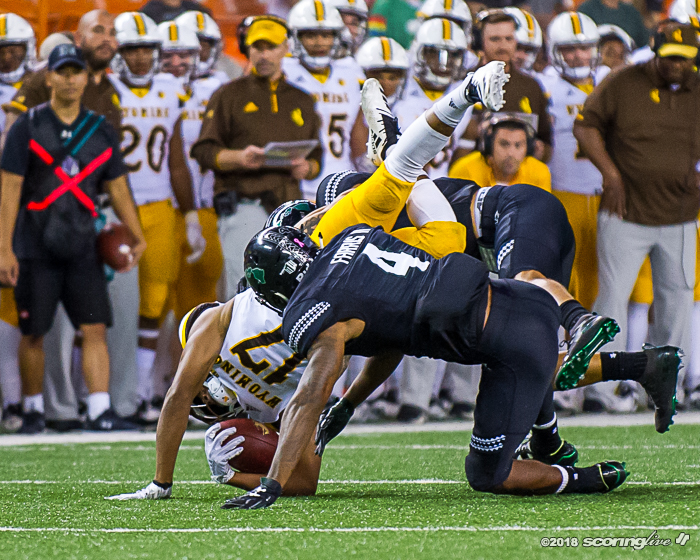 As a true freshman 18-year-old kid out there, that moment wasn't too big for him. 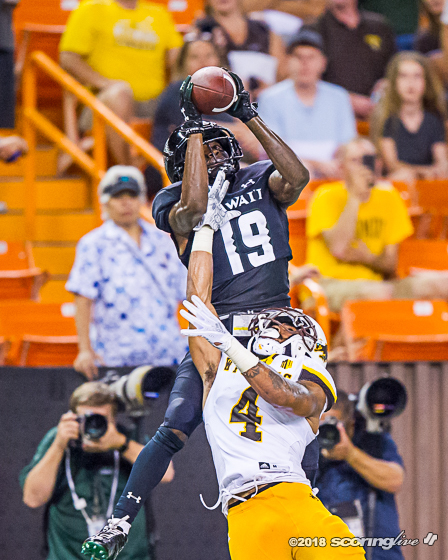 He fought through that because he cares about the players on this team and I thought he gave JoJo a great ball. 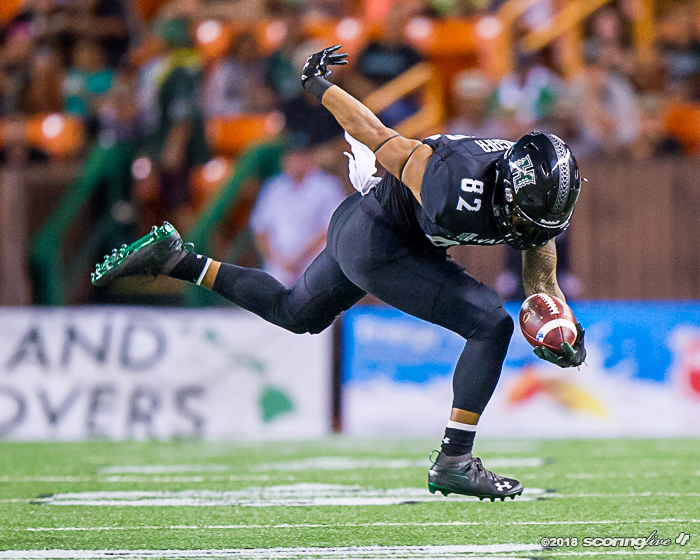 JoJo deserves a lot of credit to go up and big boy that ball to win the game." 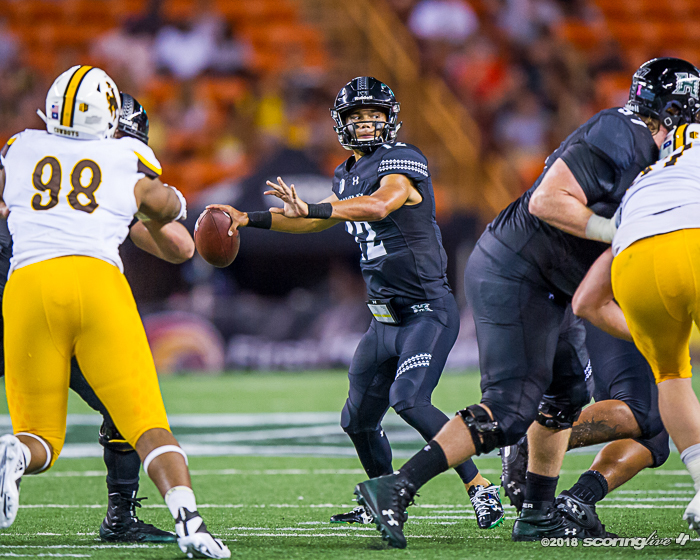 Regular starting quarterback McDonald was held out due to an undisclosed injury. 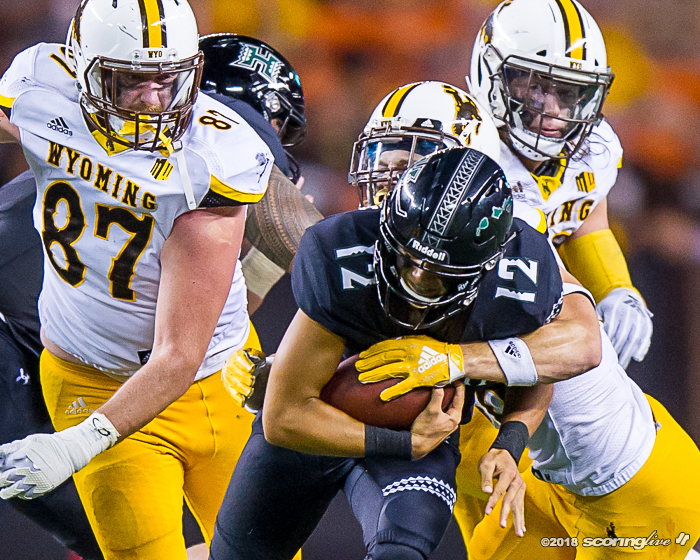 But even without the nation's leading passer in yards and touchdowns, it was the defense that came up big with its best performance against an FBS opponent this season. 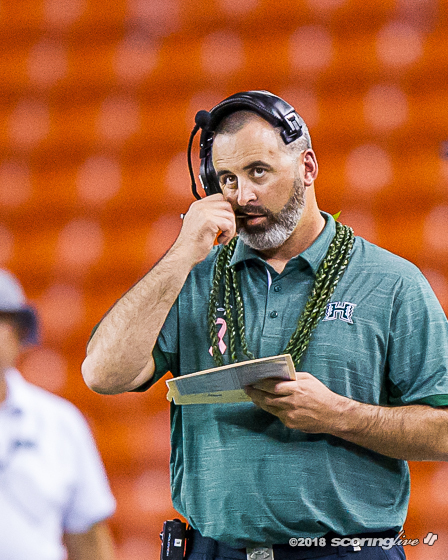 While holding the Cowboys to zero offensive touchdowns and just 244 yards of total offense, it still came down to the final few plays. 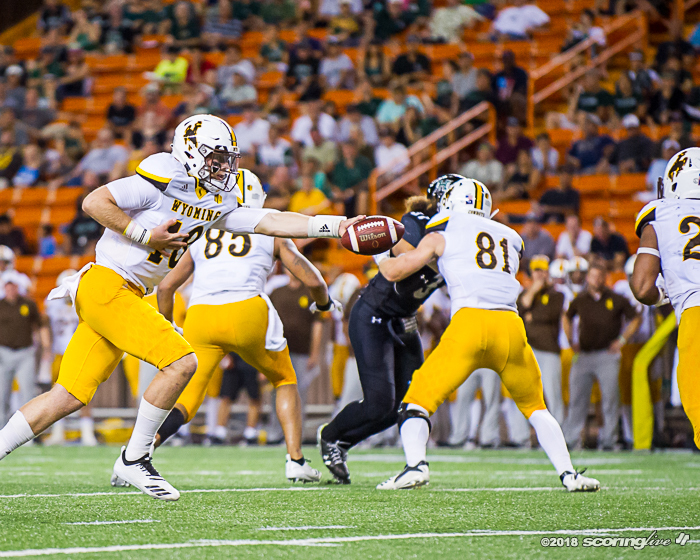 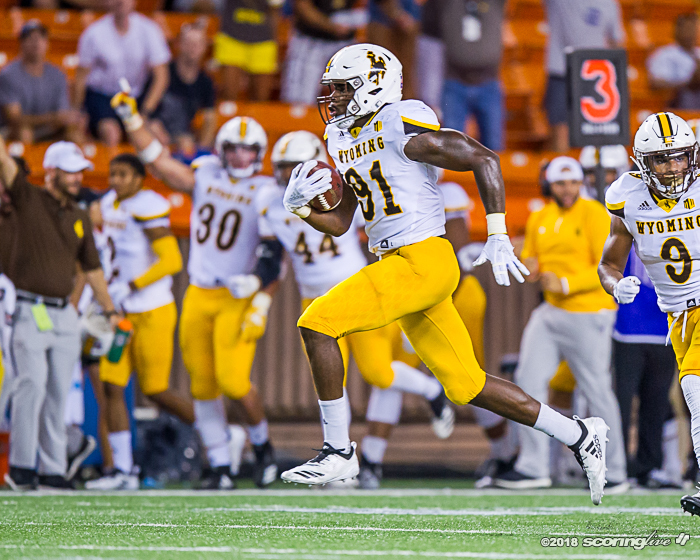 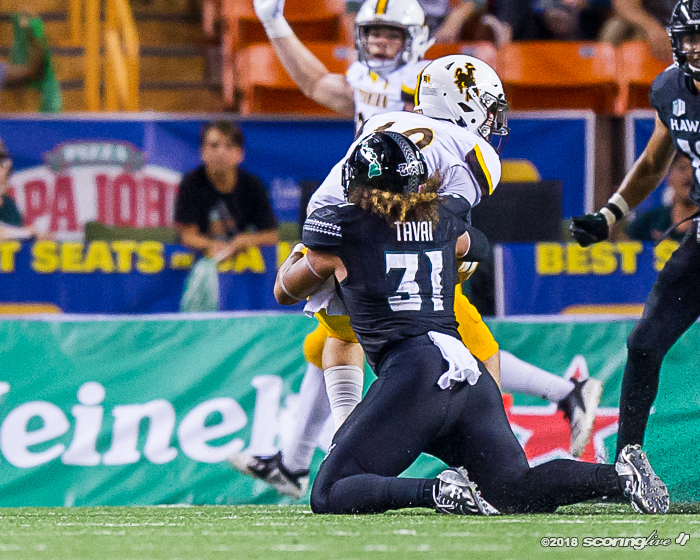 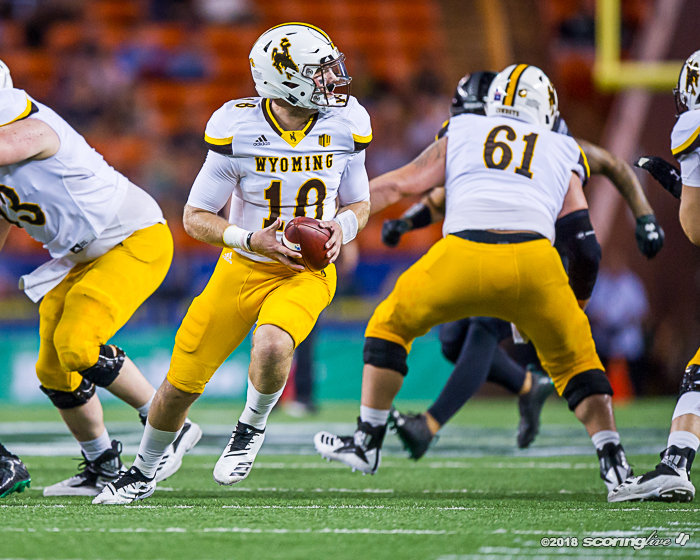 Wyoming started with the ball at its own 32 with 1:19 left following Hawaii's go-ahead score. 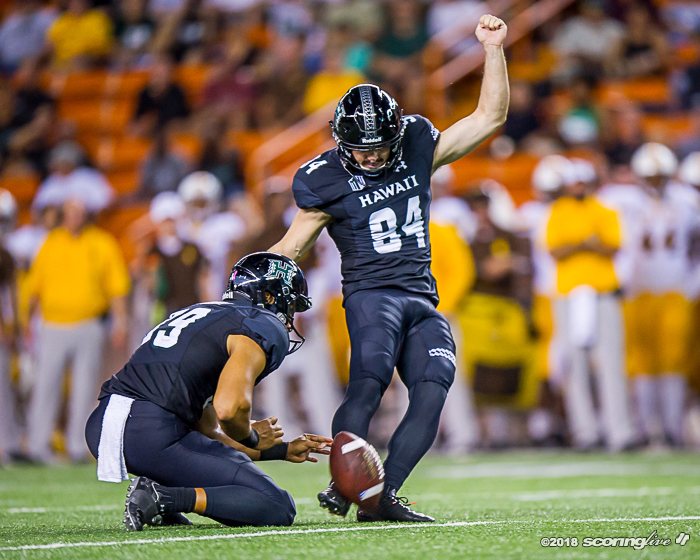 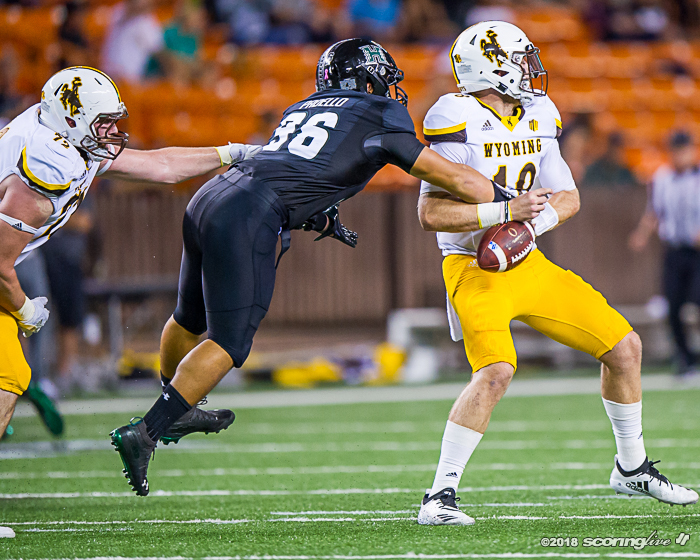 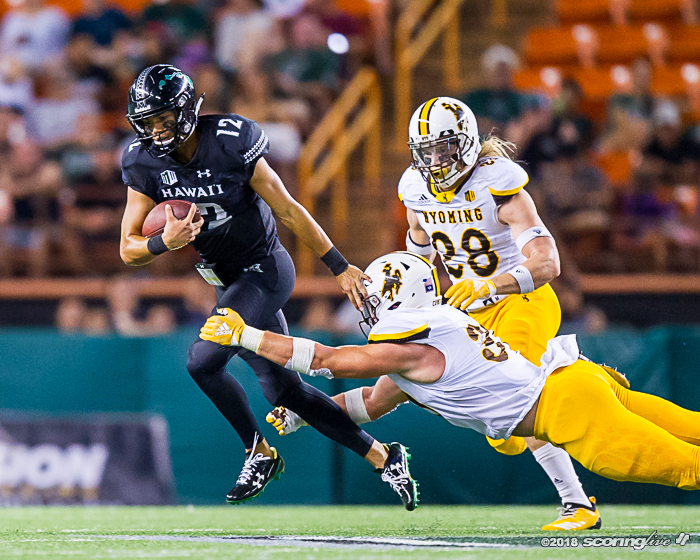 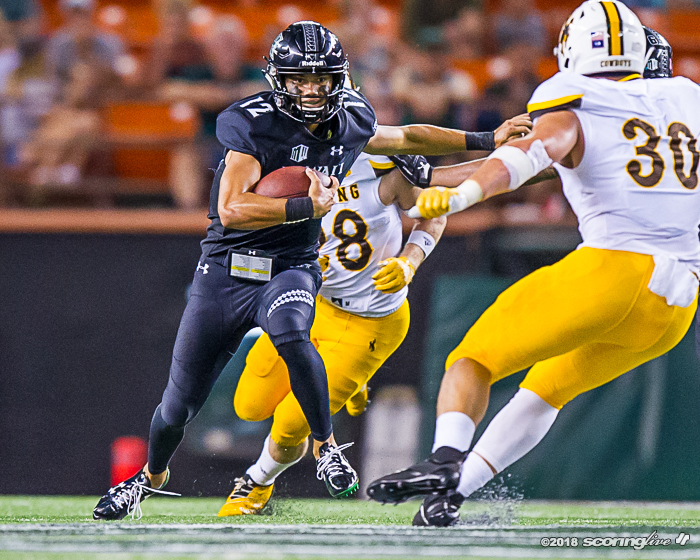 Quarterback Tyler Vander Waal completed four-straight passes and the help of a defensive pass interference penalty brought the ball all the way to the Hawaii 24. 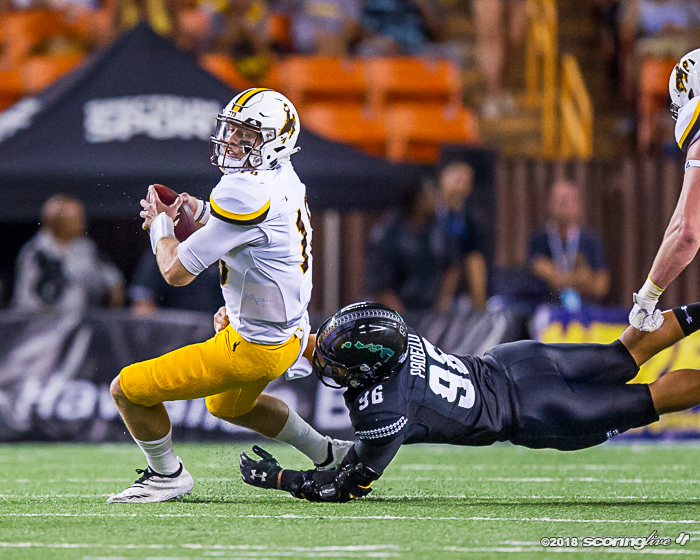 But two plays later, he was sacked by defensive lineman Zeno Choi (Kaiser '15) for a six-yard loss. 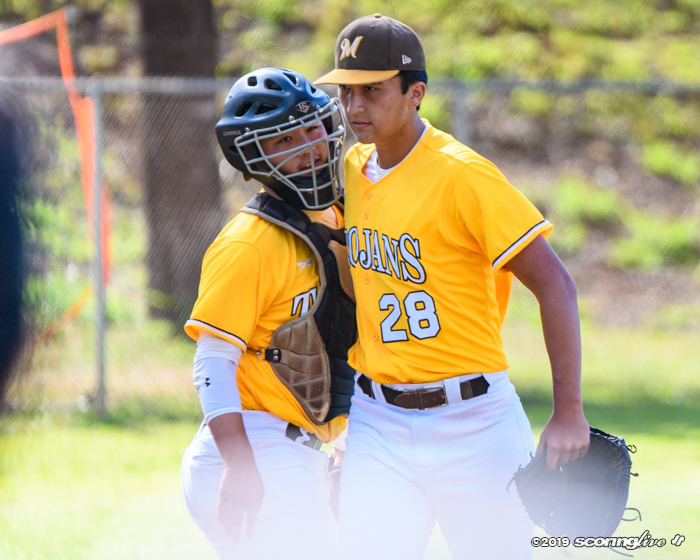 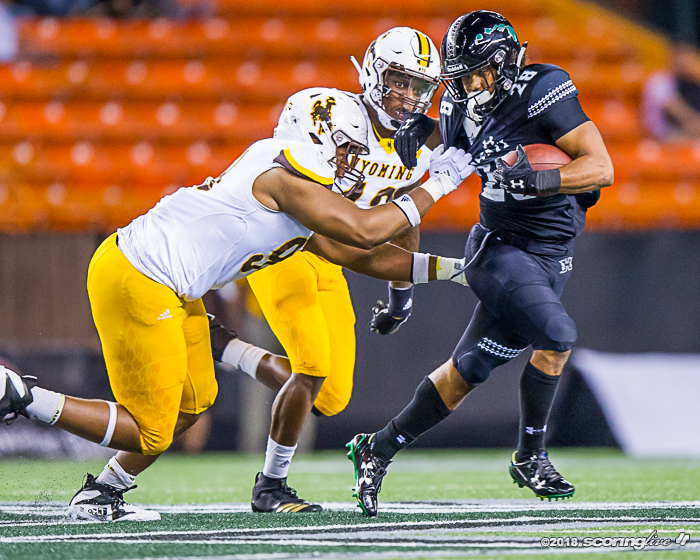 Following a timeout, defensive end Kaimana Padello (Mililani '16) got his arms around Vander Waal and caused an incomplete pass to bring up fourth down with nine seconds left. 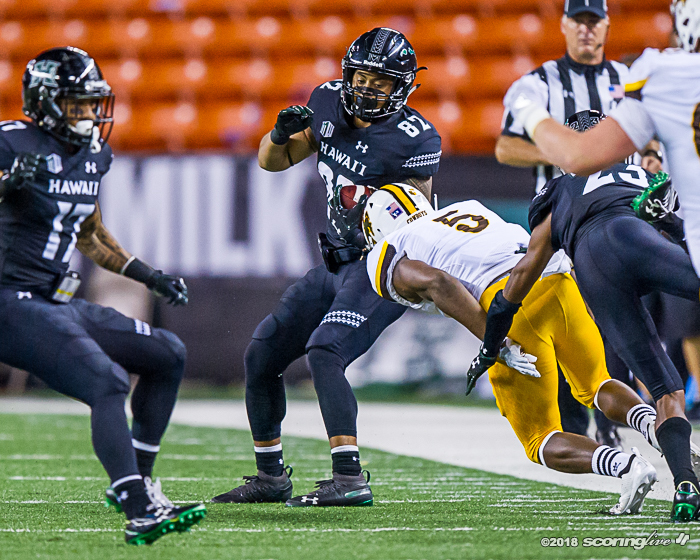 A false state penalty pushed the Cowboys back to make it fourth and 21 and Vander Waal hit James Price over the middle for a first down at the Hawaii 14 yard line with time momentarily stopped to move the chains. 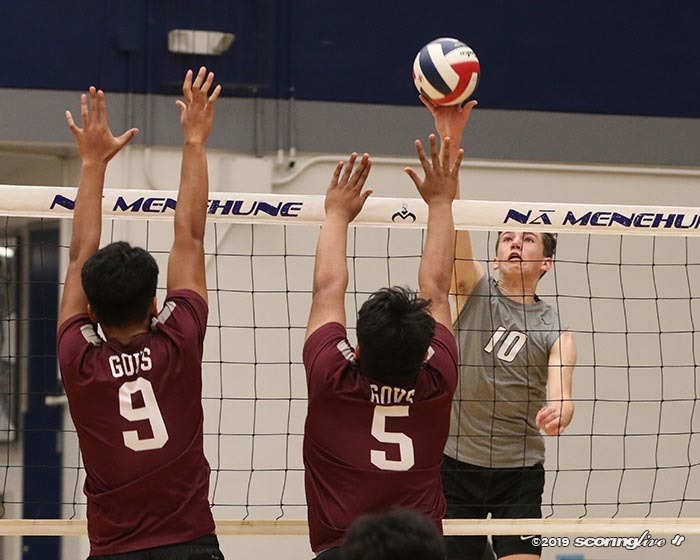 With seemingly only one second left, Vander Waal opted to spike the ball and the game was over. 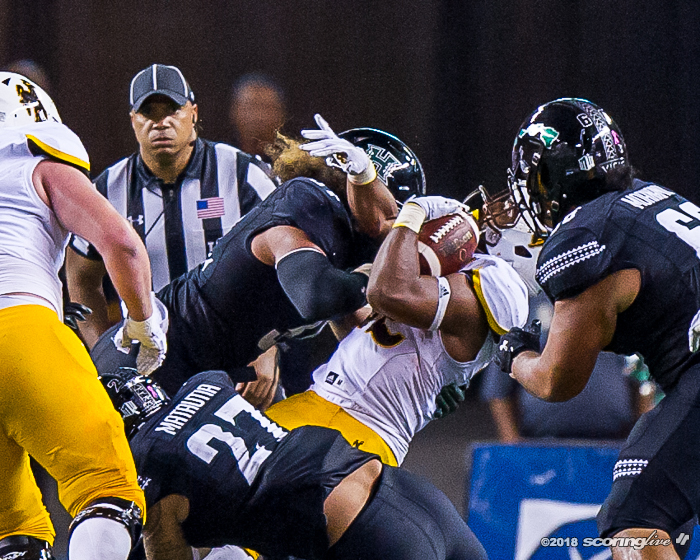 "I feel like the crowd had a big impact on the last drive. 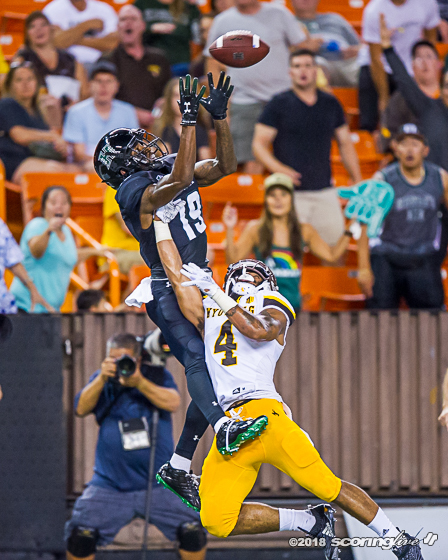 I never heard Aloha Stadium that loud," Choi said. 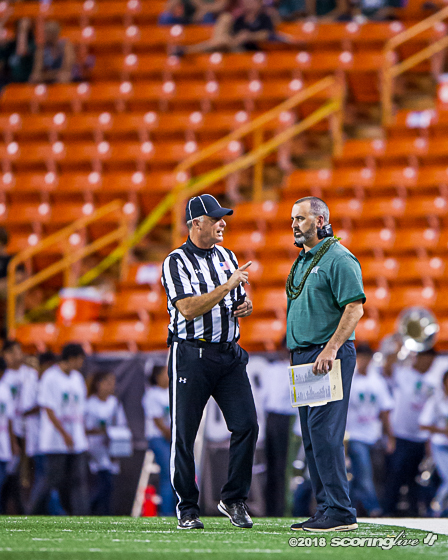 "For all of us to just do our job and play lights out football ... 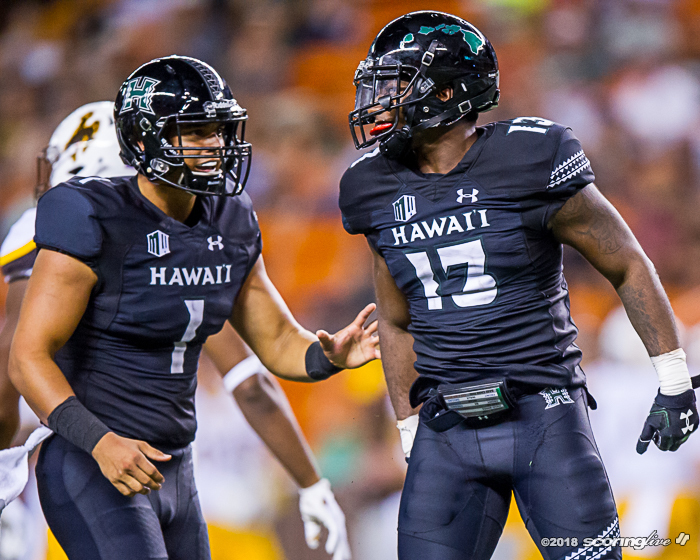 I feel like it was just a perfect example of playing Hawaii Football and trusting each other." 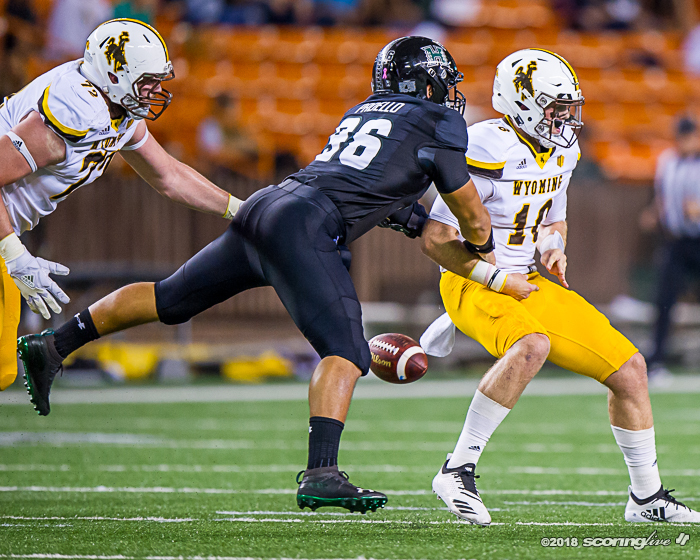 Padello finished with two sacks, three tackles-for-loss and a forced fumble. 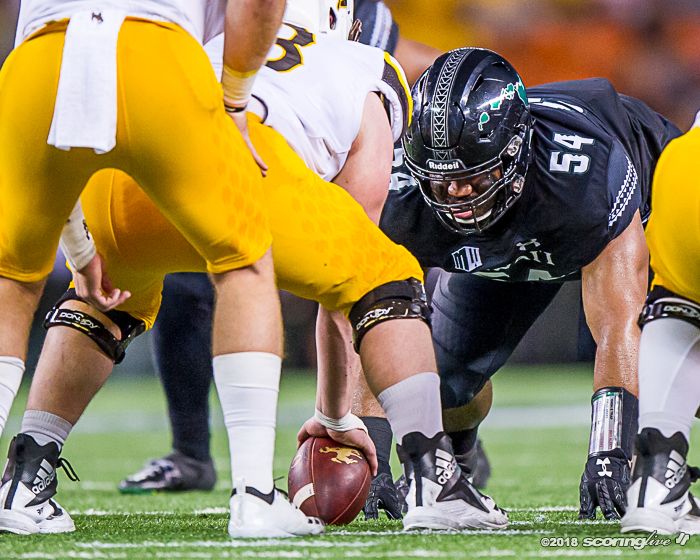 His total of seven sacks on the season puts him tied at No. 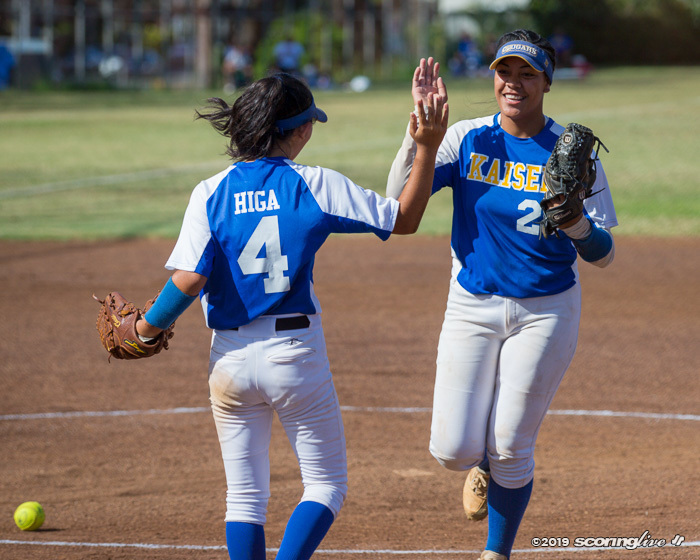 2 in the nation. 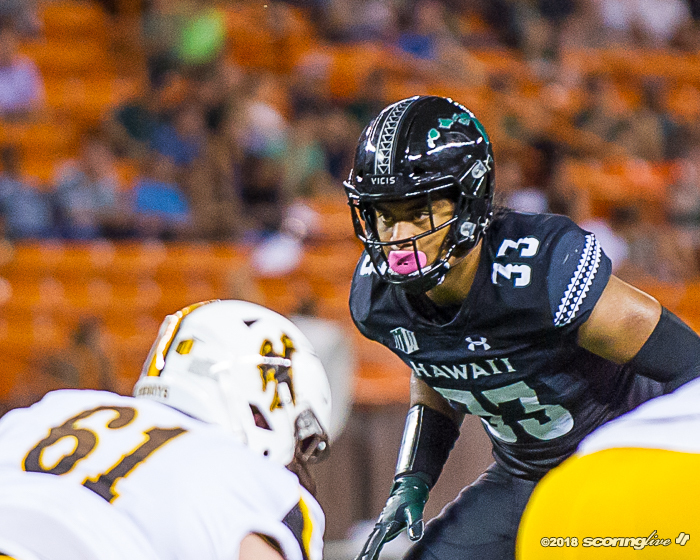 Linebacker Solomon Matautia (Campbell '15) also had a sack and finished with nine total tackles with 1.5 for a loss. 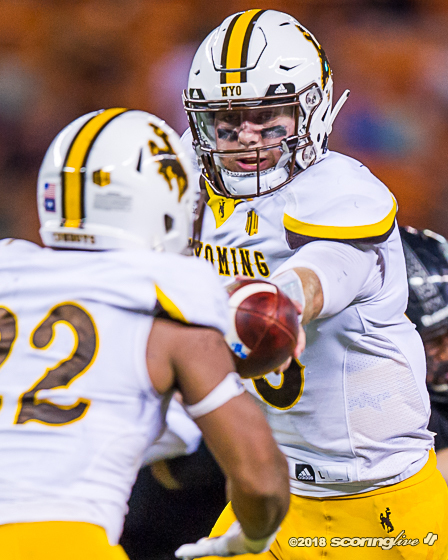 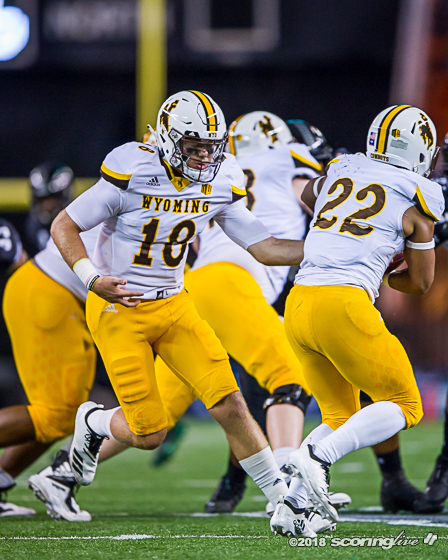 Cordeiro finished on 19-of-29 passing for 148 yards and two touchdowns but did throw a pick-six interception in the third quarter to give Wyoming its only touchdown of the game. 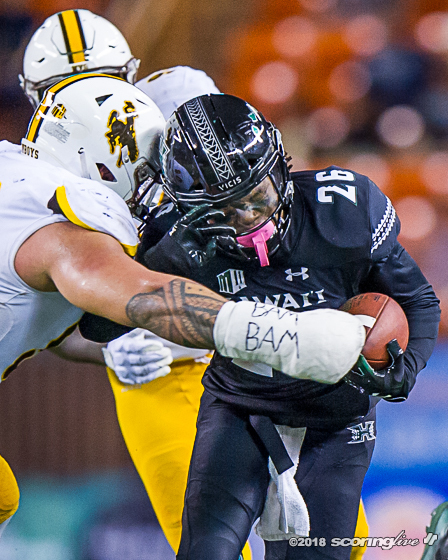 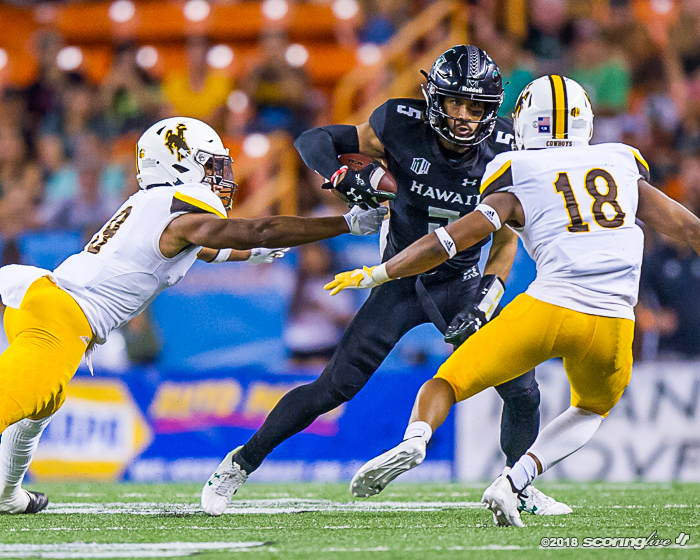 Hawaii responded two drives later when it started with good field position at the Wyoming 33 following an unsportsmanlike conduct penalty on the punt return. 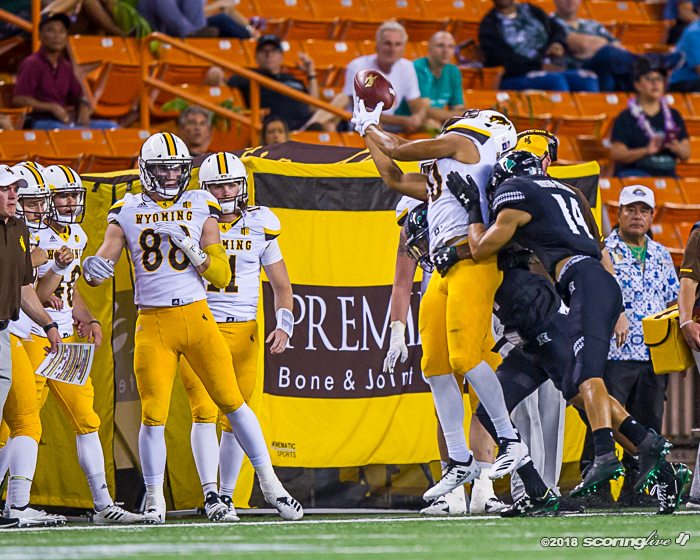 Five plays later, Cordeiro hit Cedric Byrd on a whip route to the left side for a five-yard touchdown. 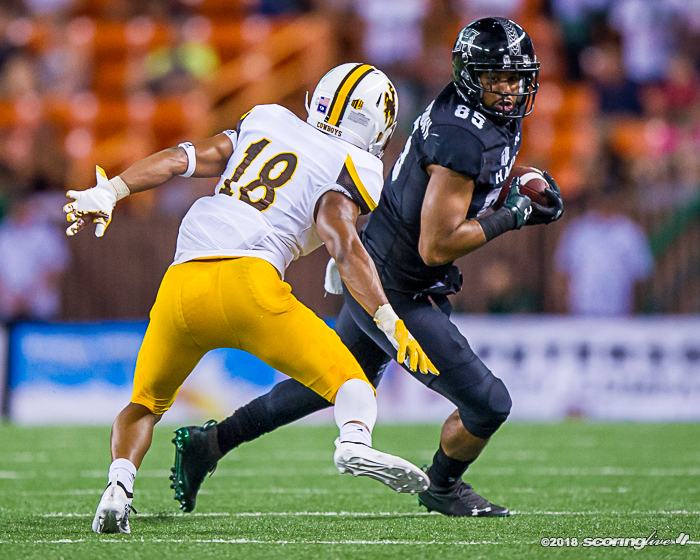 Byrd finished with three catches for 23 yards and the touchdown while Ward finished with four receptions for 48 yards. 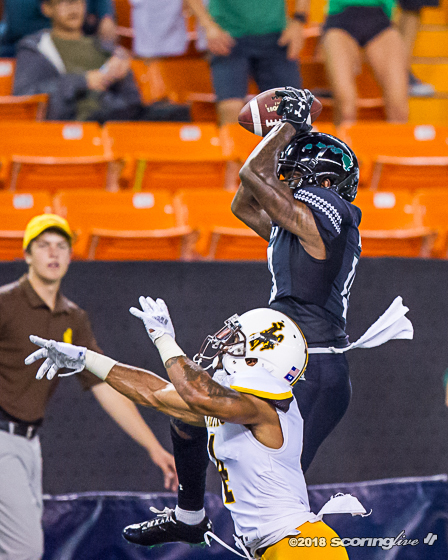 Marcus Armstrong-Brown led the team with six catches for 49 yards. 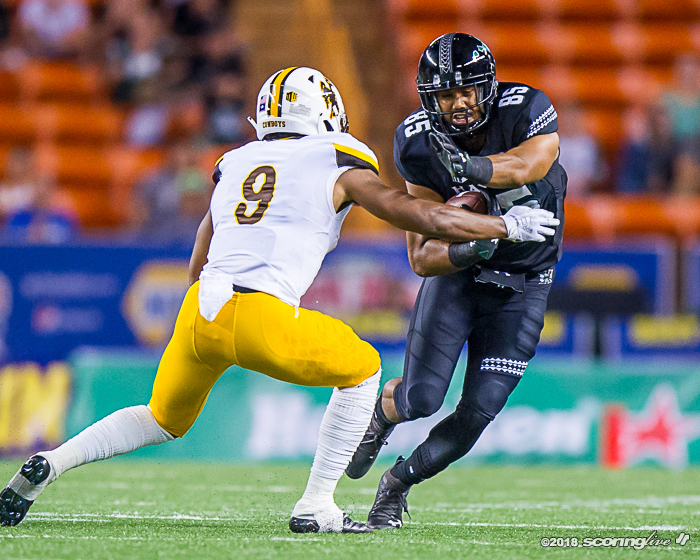 Nation-leading receiver in receptions, yards and touchdowns, John Ursua, caught five passes for 30 yards. 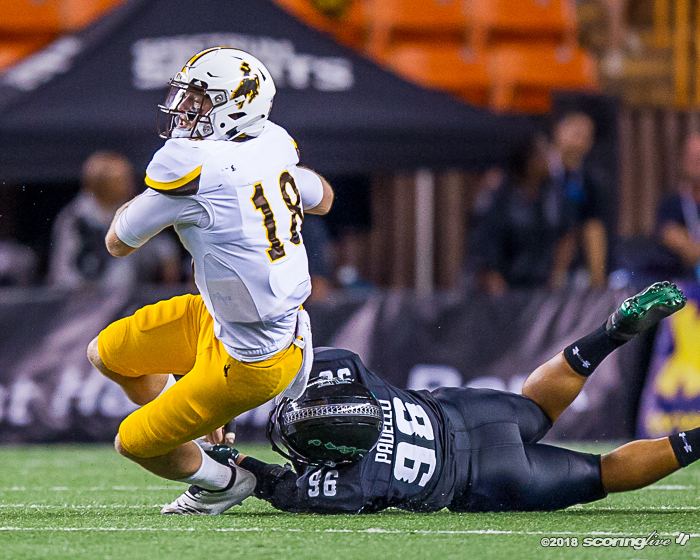 Furuta carried the ball 16 times for 101 yards, making it his second game going over the century mark this season. 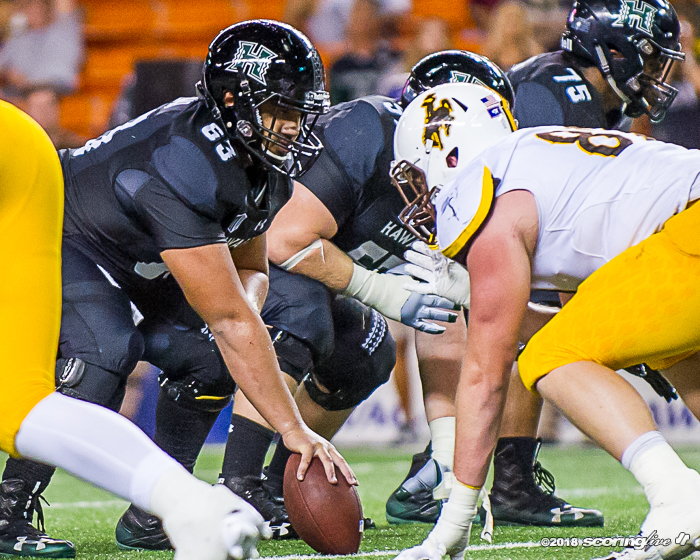 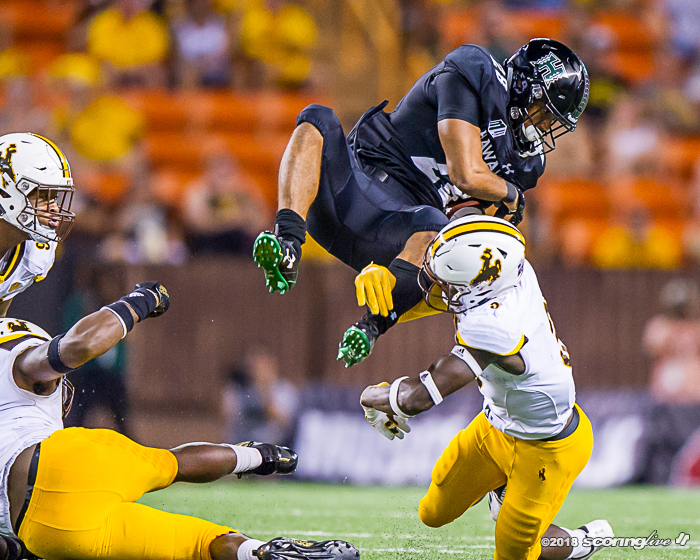 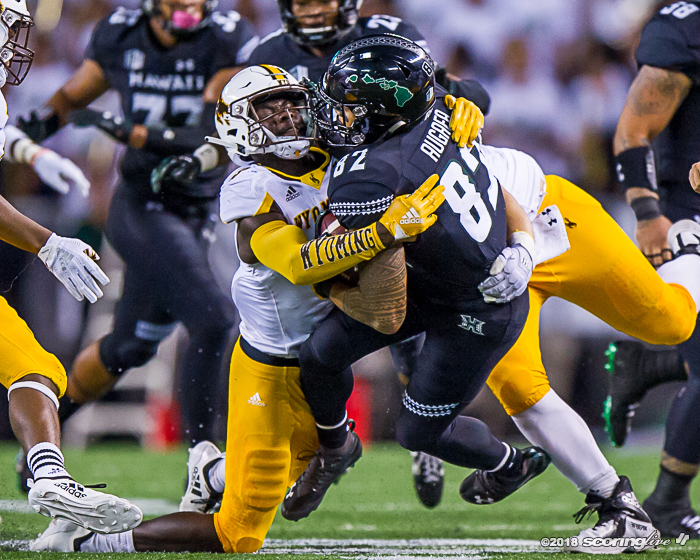 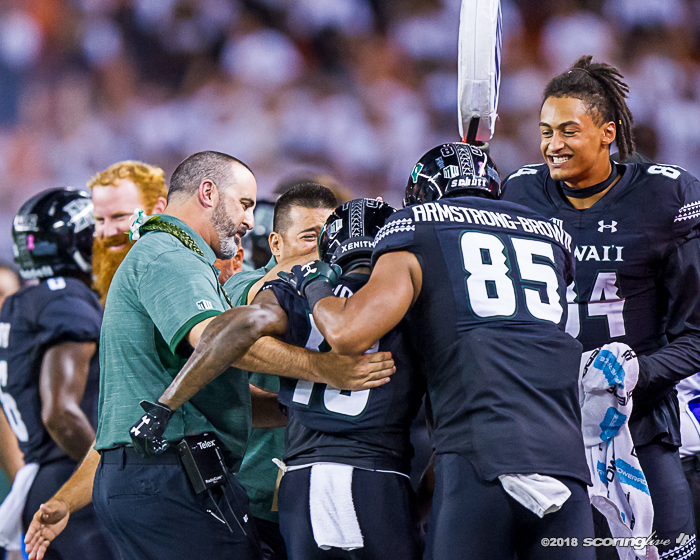 The Rainbow Warriors improved to 6-1 (3-0 MW) and also reclaimed the Paniolo Trophy with the victory over Wyoming. 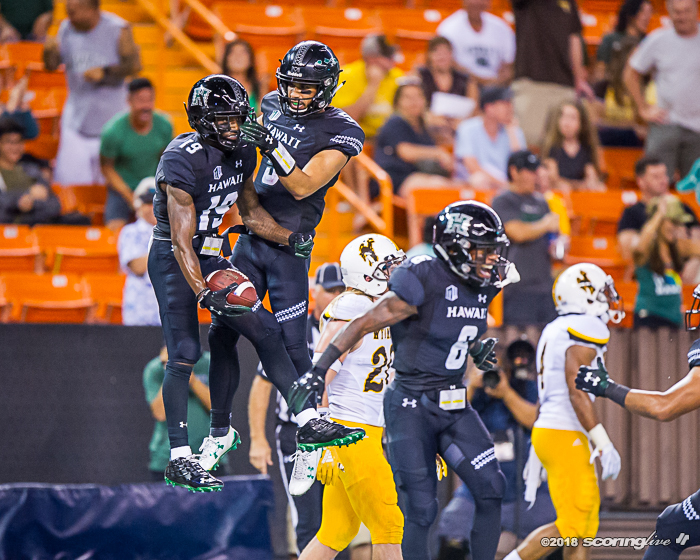 Hawaii takes a trip to Provo, Utah for a non-conference matchup against Brigham Young on Oct. 13. 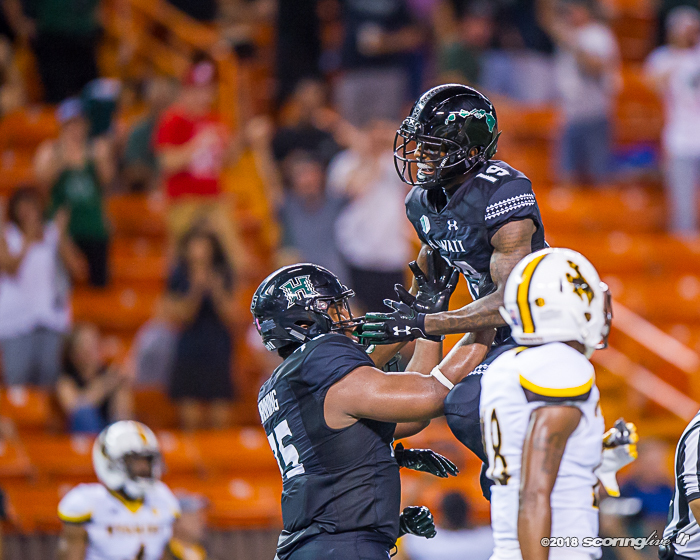 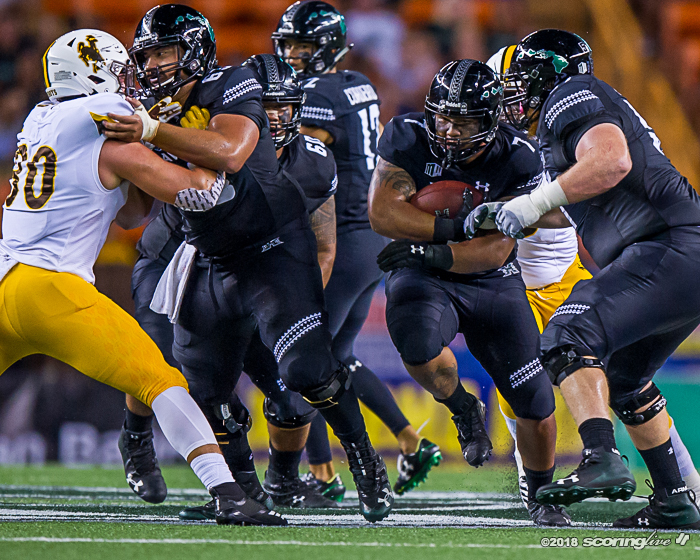 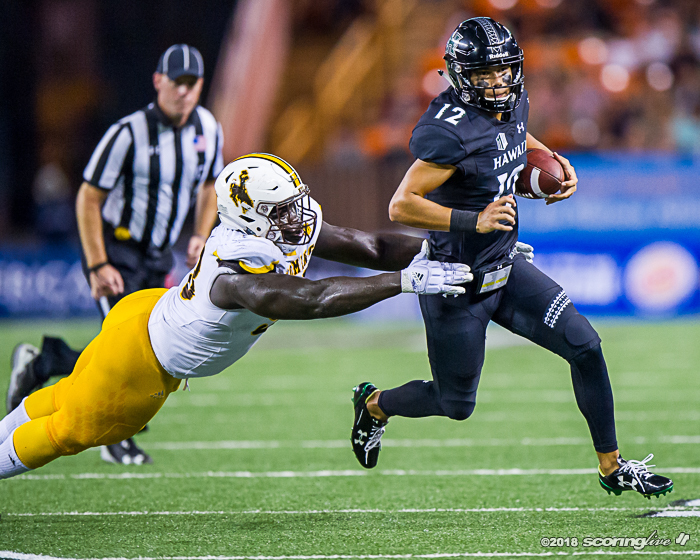 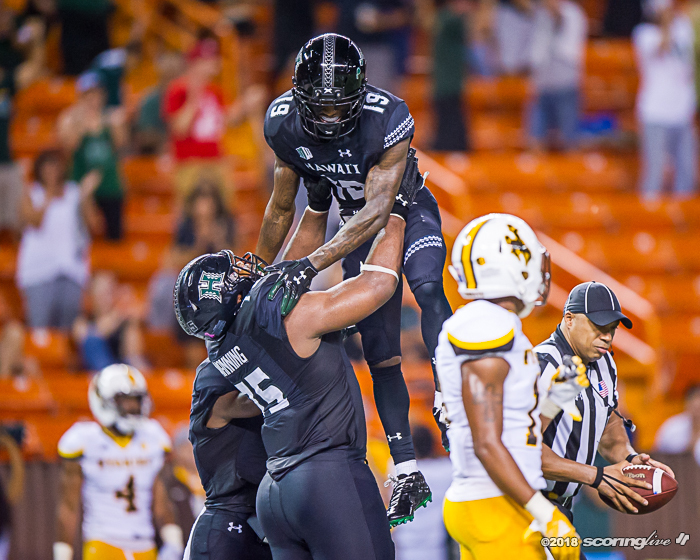 The Rainbow Warriors only need one more victory to become bowl eligible. 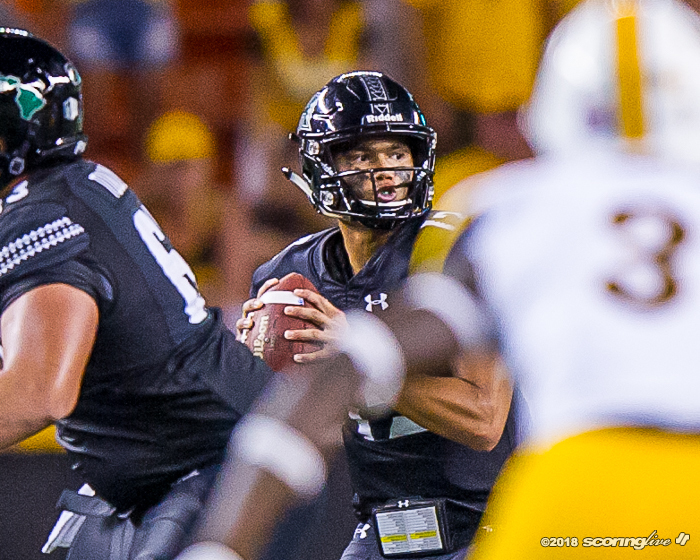 They'll return home to take on Nevada on Oct. 20. 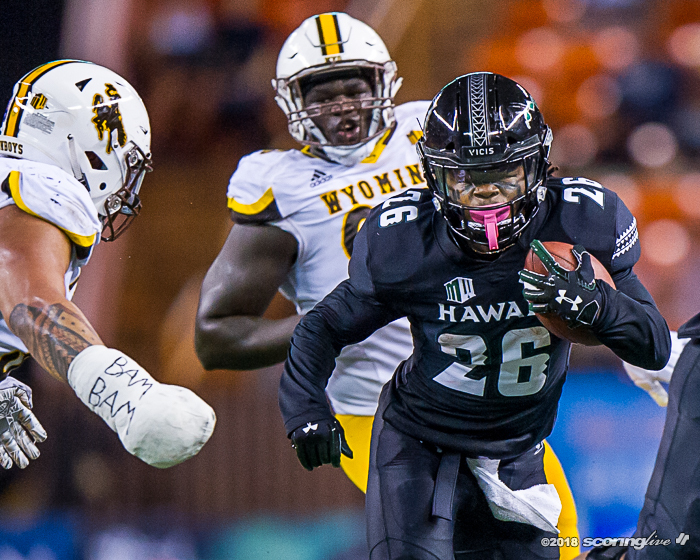 Attendance for tonight's game was reported at 23,907.